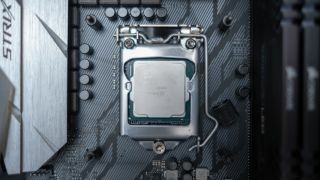 Intel Core i7-9700K and i9-9900K processors have showed up for preorder on European retailers, fueling speculation that the release is right around the corner. We previously reported on a leaked Intel roadmap which pointed to the Core i5, i7 and i9 Coffee Lake-S models launching on October 1. CentralPoint, the retailer that posted the early pre-order (and has since taken it down), said that it would be getting stock on September 7, as reported by Wccftech. If this is true, it would seem to back up that October 1 release date. The Core i9-9900K is being listed by Netherlands-based retailer Dutch Computer Centre for €561 (about $652, £507), which would fall in line with what we’d expect a Core i9 processor to cost. This is likely a placeholder price, though, and we’ll see official pricing once Intel actually announces these next-generation processors. What we want to know is what’s going on with the rest of the 9th-generation lineup. We’ve only really seen solid information about the high-end parts, with only shaky leaks and speculation to guide our hand when it comes to the Core i5 and i3 lineup. Some of these low-end processors did show up on a leaked microcode revision, but as it wasn’t published by Intel directly, we have to take it with a grain of salt. Either way, October 1 is coming fast, so we’ll see whether any of this information is accurate one way or another. We expect the pricing at least to change. Hopefully Intel will cater to the mid-range as well – Ryzen 2nd Generation is unforgiving competition these days.